Click on the posts listed below, where I’ll keep you updated on my adventures in Ecuador, which began in January of 2008. Below these posts is a little about Ecuador’s history. Ecuador is situated just below Colombia, on the Pacific Coast of South America. On the East and South it is bordered by Peru. It is a small country caused by many wars of the past with it’s neighbor Peru, who in the past has periodically chiped away at their borders. In recent years this encroachment has stopped and Ecuador and Peru are peaceful neighbors. The Equator slices through Ecuador, but because of its many high Andes Mountains, temperatures are often cool and sometimes deathly cold. Quito is the capital of Ecuador, and is on the opposite side of the country from Cuenca. Ecuador is a short 1 hour, 45 minutes from Panama City on COPA, which makes my commute back and forth an easy one. And now, for a brief History of Ecuador….. The history of pre-Inca Ecuador is diverse, advanced indigenous cultures such as the Chorrera, Jama Coaque, Bahia, Tolita, Machalilla and Valdivia ( the oldest known culture in the Americas ), flourished between 12,000 B.C. to 1,500 A.D. in the territory that today is Ecuador. It is generally believed that Asian nomads reached the South American continent by about 12,000 BC, and were later joined by Polynesian colonisers. Centuries of tribal expansion, warfare and alliances resulted in the relatively stable Duchicela lineage, which ruled more or less peacefully for about 150 years until the arrival of the Incas around 1450. Despite fierce opposition, the conquering Incas soon held the region, helped by strong leadership and polices of intermarriage. By the early 1500s, the Inca Leader Huayna Capac had consolidated his conquest of the territory that included Ecuador. War over the inheritance of the new Inca kingdom weakened and divided the region on the eve of the arrival of the Spanish invaders. The first Spaniards landed in northern Ecuador in 1526. Pizarro reached the country in 1532, and spread terror among the Indians thanks to his conquistadors’ horses, armour and weapons . The Inca leader, Atahualpa, was ambushed, held for ransom, ‘tried’ and executed, and the Inca empire was effectively demolished. Quito held out for two years but was eventually razed by Atahualpa’s general: Rumiñahui, rather than be lost intact to the invading Spaniards. Quito was refounded in December 1534. 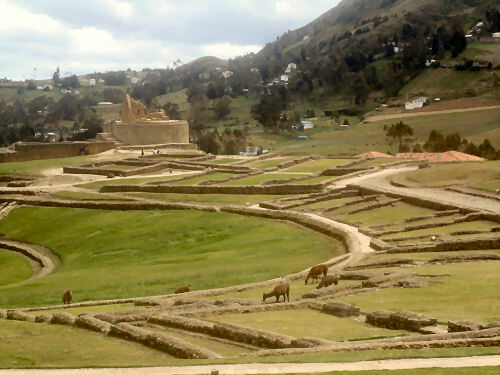 Today there is only one intact Inca site in Ecuador – Ingapirca, to the north of Cuenca. After the Inca Empire´s defeat in 1534, the Spanish colonists established themselves and became the new ruling elite of Ecuador. During the Colonial Period, Ecuador became the seat of a royal audiencia. The arts flourished and scientists such as La Condamine and von Humbolt were attracted to Ecuador. There were no major uprisings by the Ecuadorian Indians, even though their life was abysmal under Spanish rule. 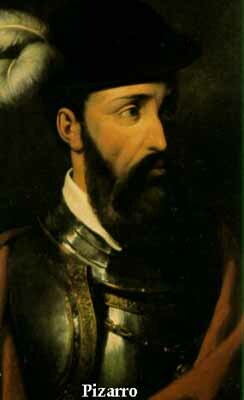 The colony was ruled from Lima in Peru until 1739, when it was transferred to the viceroyalty of Colombia. It was largely rural and conservative, with large estates of introduced cattle and bananas farmed by forced labour. As a creole middle class began to emerge, there were several attempts to liberate Ecuador from Spanish rule. On August 10, 1809 Quito established the first self governing junta in the Spanish colonies in America. 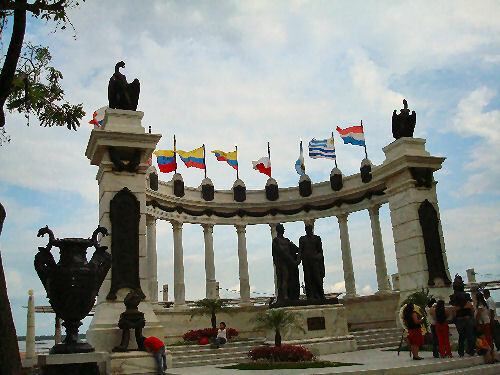 Guayaquil declared its independence on October 9, 1820. Independence was finally achieved by Simón Bolívar on May 24, 1822, but the independence forces were lead by Antonio José de Sucre. The first years of the Republic were marked by instability and power struggles. History evolved around the figure of the first President, Venezuelan born General Juan José Flores. During this government the first constitution was written. Quito was chosen as the capital of Ecuador and catholicism was the oficial religion of the State. Vicente Rocafuerte divided the country in Provinces administered by a governor. He was very instrumental in the development of the following schools: San Bernardo( Loja), San Vicente and the Naval Academy in Guayaquil. During the second goverment of J.J. Flores the third constitution was written and was denominated the “slavery Act” since all male Ecuadorians between the ages of 22 – 55 years had to pay a “tribute” tax of 3 pesos and 5 reales. General José María Urbina (1851 – 1852) gave freedom to all the slaves in Ecuador and he declared that all Ecuadorians have equal rights. During General Francisco Robles goverment Peru invaded Ecuador and took Túmbez; he created many schools and the “tribute” tax was abolished. By 1860, Gabriel Garcia Moreno consolidated the country and an era of conservatism began with support from the Catholic Church, which lasted until 1895. In order to become a citizen, Ecuadorians had to be 21 years old, married and they had to be literate. Juan Montalvo, ecuadorian writer, who was living in Colombia, because he was exiled from Ecuador, wrote an article called “The Perpetual Dictatorship”. When news of the dead of Garcia Moreno reached him he exclaimed, “My Pen Killed Him!”. During the last part of the 19th Century, the country flourished economically, mainly due to cocoa exports. In the late 1800s, Eloy Alfaro lead a liberal revolution that reduced the power of the clergy and sparked an era of capitalist development. Political instability predominated during the 1930s and 1940s. In 1941, Ecuador was invaded by Peru and lost control over much of its Amazon Territory. After World War II, Ecuador’s economy received a boost due to banana exports. A period of peace and prosperity from 1948 to 1960 followed with three freely elected Presidents completing their terms in Office. One key figure during these years was the five-time President, Jose María Velasco Ibarra. In the 1960s, foreign companies began to develop oil resources in the Ecuadorian Amazon region which include oil, natural gas, gold and silver and many others. In 1972, a nationalist military regime seized power, but shortly thereafter, in 1979, Ecuador returned to a democratic government. Jaime Roldos was elected in that year. Peru again attacked Ecuador and took Paquisha, Mayaycu and Machinaza in the oriental side of the Condor mountain range of the Ecuadorian Amazon region. The problem for Ecuador during this conflict wasn’t the heroism of the soldier or how much Ecuadorians love their country, but how many soldiers and weapons you have to defend this sector. At that time the Ecuadorian army had close to 18,000 soldiers and the Peruvian army had 70,000. The Peruvian forces had 60 helicopters Ecuador had 3. Taking into consideration the terrain where this conflict was fought (the jungle) and considering the fact that the Ecuadorian Air Force kept the airplanes on the ground and since there were no SAM portable launchers, the upper hand was on the Peruvian side. President Jaime Roldos died in 1981 in an airplane accident in the southern province of Loja. His constitutional successor, Oswaldo Hurtado held the Presidency until 1984. In August 1984 León Febres Cordero, a Social Christian assumed the Presidency. During his presidency, Febres Cordero introduced free market policies. In 1988 Rodrigo Borja, from the Democratic Left Party was elected President. During his government Ecuador lost Pachacutec to the Peruvian forces that did not care for the “Gentlemen’s Pact” between Ecuador and Peru. The Peruvian government said that this pact was no longer valid due to the dead of the minister of foreign relations, however the Peruvian troops did not leave Pachacutec. Borja is succeeded by Sixto Durán Ballén in 1992-1996. During the Durán Ballén administration, modernization initiatives were introduced and stabilizing macroeconomic policies were implemented. International relations with the United States were strengthened and efforts were carried out to solve Ecuador’s territorial dispute with Perú. Peruvian forces attempted an invasion to Ecuador in the Alto Cenepa river region, tried to occupy Tiwintsa and suffered heavy casualties including 9 military aircraft due to AA missile fire and air to air combat. Ballen is succeeded by Abdala Bucarám. He is the worst president ever in the history of this small nation. Corruption was rampant during his administration. He suffered widespread protests due to the level of corruption in this administration and the huge increments in cost on basic services of up to 500%. Corruption was his trade mark and quite frankly he was an embarrassment for the entire nation. He called himself “the madman“, he recordered a song titled a “Madman in Love“, he accused former presidents of being donkeys, the newspapers in Ecuador wrote about the party that his son gave in Guayaquil for his first million dollars, while “working” for customs administration. After the huge turmoil of February 5, the people of Ecuador demanded that the “Madman” leave the presidency of the country, the nation was in a brink of colapse due to lack of leadership. Three people then claimed the presidency of the country, the Vice President Rosalia Arteaga, the Interim President elected by Congress and the ousted Abdala Bucaram. Congress voted 44 – 34 votes against Abdala Bucaram and he was relieved of the highest political office in the nation, for reason of “mental incapacity“. Dr. Rosalia Arteaga was elected “Interim President” by Congress with the blessing of the armed forces of Ecuador under the leadership of General Paco Moncayo, a man considered a national hero of the Cenepa military campaign. Fabian Alarcon 1997 – 1998 is elected “Interim President” by Congress until 1998. In 1998 Jamil Mahauad was elected President of Ecuador and served from 1998-2002. Jamil Mahauad and Fijimori’s Peruvian President signed a peace treaty in 1998 which still stands. 21st of January of 2000 Jamil Mahauad after an indean and military revolution, resigned; and his vice president Gustavo Noboa assumed the role of President of Ecuador., a position in which he remained until December of 2002. In 2002 Lucio Edwin Gutierrez Borbuda ran for President on a platform of fighting corruption and reversing neoliberal economic reforms. He defeated banana magnate and the wealthiest man in Ecuador Álvaro Noboa in the second round with 55% of the popular vote, through a partnership with the leftist and indigenous movement parties. Gutiérrez alienated many of his supporters by supporting the Free Trade Area of the Americas (FTAA) and by keeping the status-quo on economic issues. After three months of government, Gutiérrez broke his alliance with leftist parties and reached an agreement with the PSC, continuing the economic policies of its predecessors and increasing bonds with the United States. The government received increased frequent accusations of corruption and nepotism. After two years, Gutiérrez broke the agreement with the PSC, further weakening the government politically. 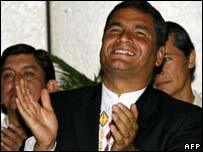 On December 8, 2006, the nation elected a new kind of president…..Rafael Correa, and re-elected him again on April 26, 2009. This man was educated at Harvard and obtained his PhD in Economics from the University of Illinois. He has instituted a new Constitution, to give more rights to the people and create more social programs in education, health care and infrastructure. He is close allies with Hugo Chavez of Venezuela, but he continues an arms length relationship with the US. Chavez is building Ecuador a big oil refinery, which will allow them to refine all of their own oil, rather than sending it abroad and returning it refined. The new Constitution allows Correa to run for his office more than once, and if he is successful in all those elections, he could stay in the office of President through 2017. The average Ecuadorian is happy with President Correa, as he is keeping his word to make life better for the working class people, however the present economy has slowed progress on this front. The upper class is not enamored with Correa, who has passed many laws that are adverse to business and personal wealth. The US has had a AWAC base in Manta on the north Pacific coast of Ecuador since 2000, which is due to expire in 2010. Correa has refused to renew the lease on this base, which has caused the US to seek base locations in neighboring (and not friendly) Colombia. Chavez has made much of this, saying the US plans a war in South America, giving him the excuse for romancing both Russia and China, who have responded by sending money The new Constitution allows a Presdient to serve 3 five year terms, so it is possible Correa will stay in power until 2017. Despite this history of intense internal rivalry and border conflicts, Ecuador has remained peaceful in recent years and is, at present, one of the safest countries to visit in South America.